President Barack Obama on Monday courted African business leaders and announced new trade initiatives to open up East Africa’s markets to American businesses, as he sought to counter the rise of Chinese economic influence in the growing continent. The United States, he declared, wants to ‘‘step up our game’’ in a region that is home to six of the world’s 10 fastest growing economies. The president was welcomed in Tanzania by the largest crowds of his weeklong trip to the continent where his family ties run deep. Thousands of people lined the streets as his motorcade sped through this city on the shores of the Indian Ocean, some wearing shirts and traditional khanga wraps bearing Obama’s image. The oceanfront road leading to the Tanzanian president’s residence had been permanently changed to ‘‘Barack Obama Drive’’ in honor of the visit. are increasing their presence on the continent. ‘‘I see Africa as the world’s next major economic success story,’’ Obama told U.S. and African business leaders Monday. He spoke following a private meeting with top executives, including representatives from Coca Cola, Microsoft and General Electric. In earlier stops in Senegal and South Africa, the president said he welcomed world economies turning their sights to Africa, declaring ‘‘the more, the merrier.’’ But he also challenged African leaders to pick their international partners carefully, saying they should push back against countries that bring in their own workers or mine Africa’s natural resources but handle the production outside the continent — all criticisms that have been levied against China. Seeking to draw a contrast with Beijing, the president said his administration’s goal was ‘‘for Africa to build Africa for Africans,’’ and for the U.S. to be a partner in that process. 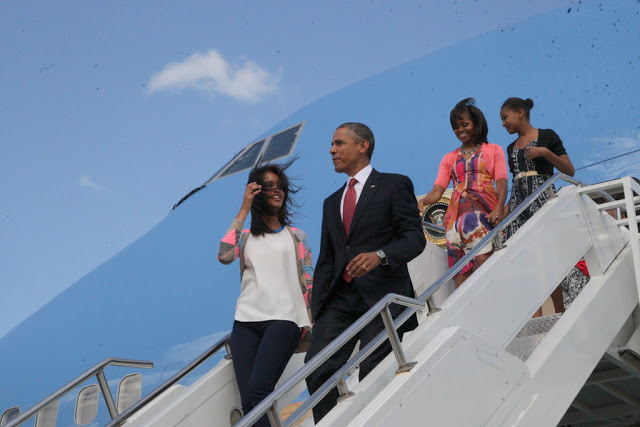 Obama’s trip marks his first stop in Africa since 2009, when he spent 24 hours in Ghana. China’s new President Xi Jinping embarked on an Africa swing less than two weeks after taking office earlier this year. During his meetings in Tanzania, Obama announced a new venture, dubbed ‘‘Trade Africa,’’ that aims to increase the flow of goods between the U.S. and sub-Saharan Africa. The initial phase will focus on East Africa—Burundi, Kenya, Rwanda, Uganda and Tanzania—and aim to increase the region’s exports to the U.S. by 40 percent. The program is designed to assist those countries trade with each other. The president cited the laborious physical roadblocks and border crossings on the continent that delay the transport of goods and products. As an example, Michael Froman, the U.S. trade representative who is traveling with Obama, told reporters it takes 42 days to export coffee out of Rwanda, compared to 14 days out of Colombia. The president’s two-day visit to Tanzania marks the final leg of his weeklong visit to Africa. He arrived in Dar Es Salaam Monday afternoon, along with wife Michelle Obama and daughters Malia and Sasha. During a joint press conference with Tanzanian President Jakaya Kikwete, Obama appeared moved by the welcome from the exuberant crowds. He cited his ties to neighboring Kenya, where his father was born, and said that his father’s family had spent time in Tanzania. Kikwete said there had never been a visit to Tanzania by a head of state that had attracted such big crowds. Obama will close his Africa trip Tuesday with a rare meeting on foreign soil between two American presidents. George W. Bush is in Dar Es Salaam for a conference on African women organized by his institute and hosted by wife Laura Bush. The presidents will attend a wreath-laying ceremony honoring the victims of the 1998 U.S. embassy bombing in Tanzania. Ahead of the meeting, Obama praised the anti-AIDS program Bush began during his tenure, the President’s Emergency Plan for AIDS Relief, known as PEPFAR. Obama rejected the notion that he’s reduced the U.S. commitment to the program, saying lower spending on PEPFAR is due to efficiencies in treating more people. Tanzania in particular has benefited from the programs started under Bush and continued by Obama. Childhood mortality has been cut in half since 2000 and more than 90,000 people are receiving anti-retroviral treatment for HIV through facilities funded by the U.S. Agency for International Development. While in Tanzania, the White House also announced a $10 million initiative to support anti-wildlife trafficking efforts on the continent. Grant Harris, Obama’s senior Africa director, said illegal wildlife trafficking is a $7 to 10 billion trade each year, with China and the U.S. the leading destinations for the animals. The president also signed an executive order creating a task force that will develop a national strategy aimed in part at reducing U.S. demand for trafficked wildlife. Associated Press writer Nedra Pickler in Dar Es Salaam and Jason Straziuso in Johannesburg contributed to this report.